Free Shipping Included! 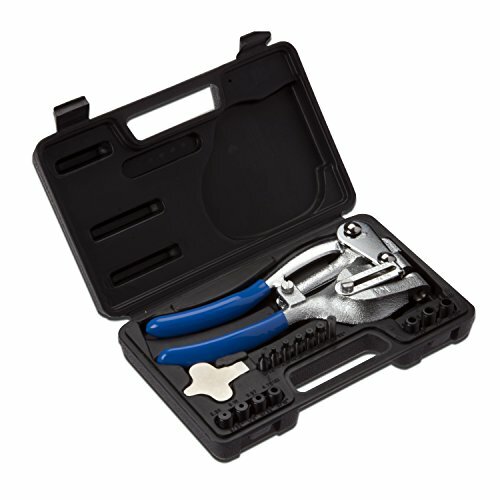 Save 1% on the Neiko 02612A Multi-Purpose Power Hole Punch Kit, 3/32'' x 9/32'' by Neiko at UCBC Group. MPN: 02612A. Hurry! Limited time offer. Offer valid only while supplies last. Durable power punch tool for precision holes through all types of materials. From thin brass metal to plastic sheet through 16 gauge mild steel. Durable power punch tool for precision holes through all types of materials. From thin brass metal to plastic sheet through 16 gauge mild steel. Features with an adjustable edge guide, easily lets you align holes in a straight line 1/4 to 1-1/2 inch from the edge. Package comes with seven quick-change, durable heat treated punch-and-die sets. Sizes from 3/32, 1/8, 5/32, 3/16, 7/32, 1/4 and 9/32 inch. Punch opens to 1/4 inch; throat depth: 1-3/4 inch. Storage and carrying case included.